Life is filled with WOW moments; those moments when we see something new that really impresses us and gets our attention. These WOW moments make our personal lives better and more interesting. The businesses that create these WOW moments, or innovations, are typically more successful. But, what is the key to creating these innovations? How are innovations born? How can simple connections between various things be made so that something new is created? Are there steps to creating new innovations and WOW moments? The answers to these questions are in this book. 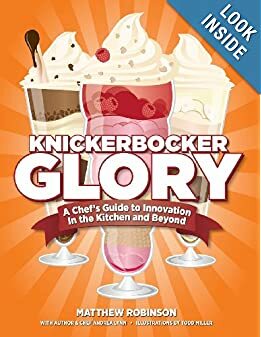 Knickerbocker Glory: A Chef's Guide to Innovation in the Kitchen and Beyond is a book about learning to innovate using the culinary arts as inspiration. More specifically, using a little known dessert – The Knickerbocker Glory – as a model to teach a simple innovation process and guide the reader through the journey from stated purpose to WOW moment. The text, infographics and insets explore how great ideas can be created, shows the importance of getting ideas off paper and into reality and discusses the importance of a team effort in innovation. The book rolls back the curtain on the specific steps to use when implementing any type of innovation program. Matthew Robinson has spent many years in the food industry as an innovator, scientist, product developer and spokesperson. He spends a great deal of time innovating both in and out of the kitchen. Because his passion is food, he has eaten his way across Europe for the past six years. He has a master of science degree from the University of Georgia in Nutrition Science and a diploma from the professional culinary program at the French Culinary Institute in New York City. Matthew lives with his wife and son in Amsterdam. Matthew Robinson uses his background as a scientist, product developer, and chef to write this book about how innovations get their start and the process involved in making them become a reality.He spells out the steps to innovation with specific examples, charts and descriptions that are easy to follow and understand. Matthew illustrates the concept using recipes. The Knickerbocker Glory is a dessert he had when traveling abroad . He uses the concept of the dessert to create other desserts of similar structure. Some of his creations are called: Cherries Jubilee, Nutty Peach, and Citrus Explosion. Through his book, Matthew has illustrated that you are limited only by your imagination when it comes to innovation. Once you read this book, you will be making and creating your own Knickerbocker Glories. Buon Appetito!